Buy live OB Peacock Cichlids from a trusted breeder. All orders shipped to your door with a live arrival guarantee. Any fish that are DOA can be replaced or refunded. The Aulonocara SP. 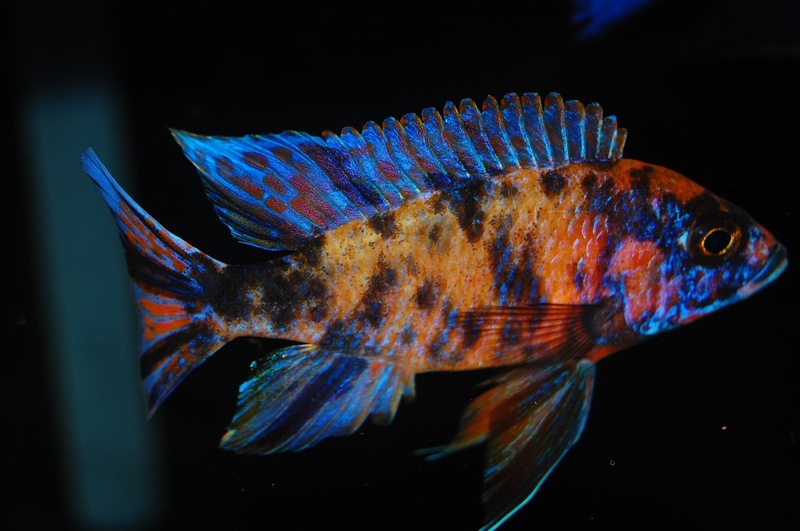 OB Peacock is a very popular species of peacock cichlid that is not native to the waters of Lake Malawi, but is a hybrid species of cichlid. It was bred by crossing a male species of Aulonocara with an OB female Mbuna. Since first being bred, several variants of the OB peacock have been introduced into the hobby. Male OB Peacock cichlids can be found in a variety of colors that range from yellow and orange, to red and blue. All OB males and females have a distinct spotting pattern that is unique to each fish, making no two fish alike. However, female OB Peacocks do not display the bright colors that males display. A recently bred strain of OB peacock that is gaining popularity in the hobby is the OB Fryeri, which is a cross of an OB Peacock with an Electric Blue Ahli. OB Peacock cichlids are fairly mild mannered Lake Malawi cichlids. For the most part they will coexist peacefully with other mild mannered peacock and haplochromis. However, a dominant male may show increased aggression levels towards other male Peacocks. Breeding males will also display increased levels of aggression. Some compatible cichlid species are the Sunshine Peacock, the Red Top Lwanda Peacock, and the Red Shoulder Peacock. Though they are not native to the waters of Lake Malawi, OB Peacock cichlids are much like the other species of Aulonocara which are found in the lake. A home aquarium should offer these fish similar living conditions for them to display their brightest colors. The substrate should be sand or fine gravel and there should be plenty of rocks to create caves and passageways for the fish to claim territories or seek protection. The water temperature should be between 78 - 82°F with a pH between 7.8 - 8.6. Additives like Cichlid Lake Salt and Malawi/Victoria Buffer will condition the aquarium water for African cichlids. OB Peacock cichlids are carnivores and should be fed a diet that contains a good amount of protein. A good diet consists of a mix of plankton based flakes and commercially prepared cichlid pellets along with occasional supplements of live (or frozen) blood worms or brine shrimp. Such foods will help bring out their bright metallic colors. Check out this tank of several OB Peacock cichlids. Though they are hybrids, OB Peacocks are the most popular of the Aulonocara species. You can visit this trusted breeder to order OB Peacocks like these ones. OB Peacock cichlids are sexually dimorphic. Males will develop bright metallic colors ranging from yellow and orange to red and blue, while females remain a pale pink, orange or brownish gray color. Males will also get slightly larger than females. Both males and females have the spotted pattern. Like all other Aulonocara and Mbuna, the OB Peacock is a mouthbrooder. When they are spawning, the female will pick up and hold the eggs in her mouth to protect them. Females may continue to carry the eggs and fry in their mouth for two weeks or longer. For optimal breeding conditions it is recommended to keep four to six females with one male when breeding. This will create an ideal breeding colony and will help spread out any aggression displayed by the male. All Aulonocara species will hybridize. And this is especially true for OB Peacocks. If you want to avoid hybridization, it is best to either, only keep males, or only keep one species of Aulonocara.